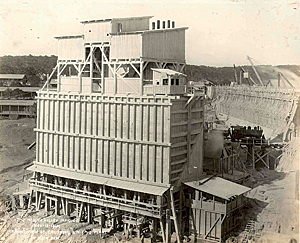 The 164-foot Medina Dam was completed in November 1912. A water improvement district and a public water and wastewater utility in Texas embarked on a parternership that will save water and modernize its delivery. The Bexar-Medina-Atascosa Water Control & Improvement District No. 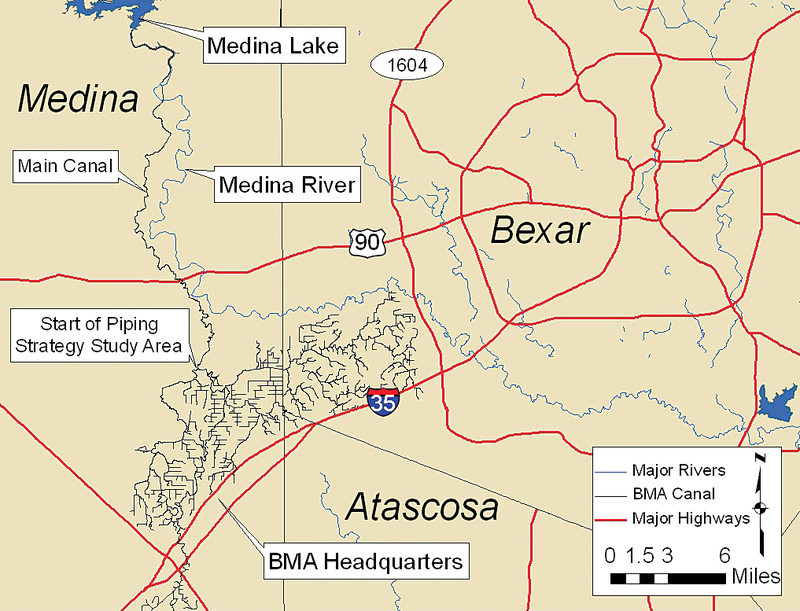 1 (BMA) is responsible for providing a reliable water conveyance system from Medina Lake for irrigation purposes. It requires all new customers along the canal to implement efficient irrigation best practices. In 2012, San Antonio Water System (SAWS), a public water and wastewater utility that serves approximately 1.6 million people in Bexar and surrounding counties, became a BMA customer and its largest source of revenue. Both SAWS and BMA have a stake in increasing the efficiency of BMA's canal system. Immediately after joining BMA, SAWS began finding ways to improve the efficiency of BMA's canal system. The first step was opening lines of communication between SAWS contractors and BMA so BMA would know about upcoming SAWS pipe replacement projects to allow BMA to reuse that pipe in its canal system. At first somewhat piecemeal and uncoordinated, the program improved when SAWS began using ArcGIS to alert BMA of upcoming pipe replacement projects. Irrigation districts across the nation are embarking on modernizing and optimizing their water delivery systems. According to the United States Department of Agriculture (USDA), irrigated agriculture across the western United States consistently accounts for 80 to 90 percent of consumptive water use in the United States. Nearly 57 million acres were irrigated in the United States in 2007, an area slightly larger than the state of Minnesota. Medina Dam, the source of BMA's water, stands 164 feet tall and has a capacity of 254,000 acre-feet. When it was constructed in 1912, it was the largest dam in Texas and the fourth largest in the United States. The extensive 250-mile canal system downstream of Medina Lake, which is entirely gravity fed, was constructed at the same time and was then the largest irrigation project west of the Mississippi River. Installing pipe (or piping) in a canal system keeps more water (and therefore money). 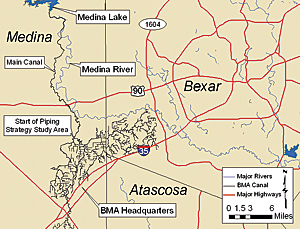 Piping Medina Lake would allow BMA to deliver water faster. Because Medina Lake is one of SAWS's many water sources, more water in the lake means SAWS can rely on it longer during a drought. This is especially crucial after 2011, the single worst meteorological year on record, which has been followed by years in which rainfall seemed to skirt Medina Lake's relatively small 609-square mile watershed. As of August 2013, storage in Medina Lake was at less than 5 percent capacity. BMA is a relatively small organization with a permanent staff of less than a dozen. Most staff are out in the field. In light of the complexity of its canal system, with many turnouts, gates, and laterals in its canal system, BMA had the foresight to recognize the value of ArcGIS and acquired a license. However, being headquartered in Natalia, Texas, a town of approximately 1,400 residents located 30 miles from San Antonio, made getting ArcGIS training difficult. SAWS is a utility of more than 1,500 employees with significantly more resources. When SAWS learned of this need for training, it sent staff to Natalia to demonstrate useful ArcGIS applications. During this visit, SAWS discovered that BMA had conducted a preliminary study on canal piping but didn't have a strategy for prioritizing which stretches to pipe first. SAWS decided to use ArcGIS to assist BMA by prioritizing potential problem areas in the canal system. After numerous conversations with BMA and other irrigation districts, along with extensive research, SAWS determined there are four main indicators of canal efficiency that could be incorporated into a simple formula. The first and most important variable is the soil type within each stretch, because the canal system is almost entirely open ditch. However, because the main canal above Pearson Lake has a relatively effective clay lining, it was not considered for this piping study. Soil type was given a weight of 40 percent. The agricultural demand within each stretch was also important. Piping these segments would yield discernible benefits, so this was given a weight of 30 percent. Slope and susceptibility to wind and solar evaporation were considered to be of equal importance, and each was given a weight of 15 percent. Soil characteristics are the most important variable. This map shows regional soil types in relation to the BMA canal system. After determining that soil characteristics are the most important variable, SAWS began scouring various databases for soil data that could be used in ArcGIS. The most useful data was downloaded from the United States Department of Agriculture Natural Resource Conservation Service (NRCS) website that identifies dozens of soil classifications and geographically allocates them into thousands of soil parcels. SAWS generalized the dozens of classifications down to six: clay, silty clay, clay loams, loams, sandy loams, and sandy soils. A numerical value was assigned to each soil parcel in the attribute table. Clays were given a value of 50, silty clay 30, clay loams 25, loams 20, sandy loams 10, and sandy soils 5. Finally, this vector shapefile was rasterized to create a raster to input in the Raster Calculator. BMA's canal system has a significant concentration of agricultural demand that justified a higher priority for piping. SAWS used an image file showing crop locations, obtained from the NRCS website, to digitize vector polygons for each crop type. Subsequently, SAWS assigned values in the shapefile's attribute table to approximate the water demand for each crop. According to the Texas Board of Water Engineers, small grains (wheat and oats) in this region require the most water per acre, followed by cotton, corn, and sorghum. This vector polygon was rasterized to create another raster. Although BMA's canal system is entirely gravity fed, there certainly are low points prone to losses from ponding, which causes evaporation and infiltration. 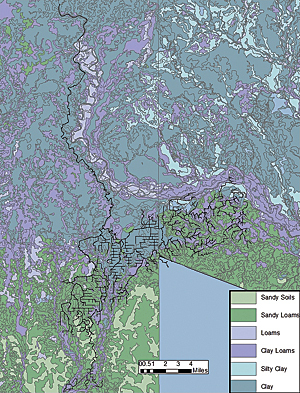 A digital elevation model (DEM) was downloaded from the NRCS website that was used to create a raster that illustrated slope (i.e., change in elevation). 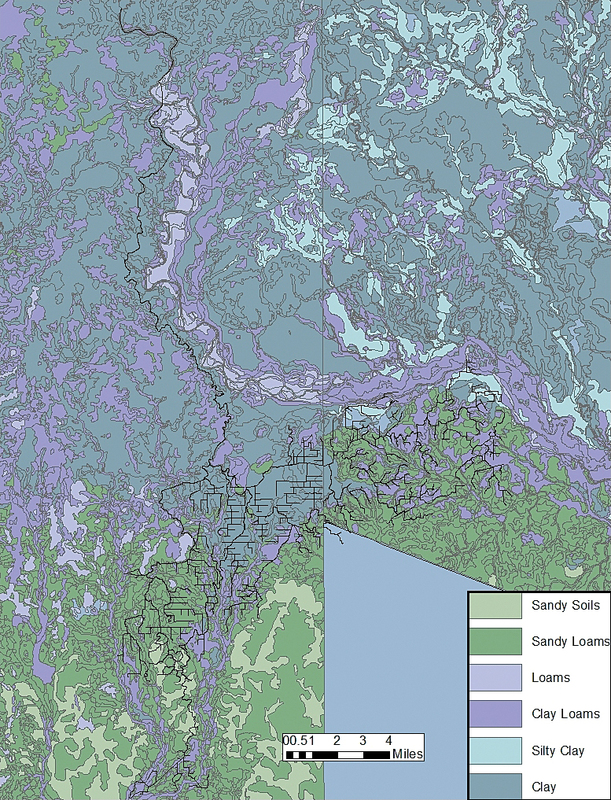 The Slope tool in ArcGIS for Desktop easily converted the DEM to a raster that contained values between 0 and 50. This was the first of five rasters that would later become input for the Raster Calculator in ArcGIS. Since this range (0 to 50) would have been difficult to edit, it served as the range for the other rasters. A slope of 0 represents an area that is extremely flat and therefore an area of high priority, while a slope of 50 signifies an area of low priority. SAWS determined that susceptibility to evaporation would account for 15 percent of the canal efficiency, allocated between wind evaporation at 10 percent and solar evaporation at 5 percent. To determine which canal segments are most exposed to wind evaporation, SAWS determined that southeast/northwest was the predominant wind direction. SAWS used the Azimuth tool to select only canal segments oriented in two ranges—140–160 and 320–340 degrees—and created a separate polygon shapefile for those segments that were given a high priority. This vector shapefile was rasterized as the fourth raster. SAWS used the same methodology to determine canal segments with the most exposure to solar evaporation and selected segments oriented east to west. This selection resulted in the creation of the fifth and final raster. Although canopy cover could be seen as a better variable for dictating how much solar evaporation occurs, riparian vegetation results in significant transpiration that negates the reduction in evaporation. The final step in this multicriteria analysis adds the five rasters to the Raster Calculator tool in ArcGIS for Desktop and plugs in a simple formula that assigned the weights to the four factors considered. The Raster Calculator uses Python syntax in a calculator-like interface that doesn't require coding experience. The output was a raster showing which canal segments to focus on piping first and which were of lower importance and could accommodate used pipes. If at any time these weights need to change, all BMA has to do is add the same five input rasters in the Raster Calculator tool, change the formula, and create a new raster. This analysis is different from a suitability analysis because, rather than identifying one or two siting locations, this analysis prioritized every foot of the 250-mile canal system. Although a similar analysis could have been done using the Weighted Overlay Analysis tool, preparing the input rasters for the Raster Calculator tool forced SAWS to better understand the data. In these arrangements, such as the one between BMA and SAWS, partners share experience and learn from each other—both stand to gain. This type of collaboration builds trust among regional players. It differs from regionalization because it brings cost savings associated with having specialized and responsive staff available to assist in the operation of a rural water system. The budding partnership between SAWS and BMA comes at the 100-year anniversary of the Medina Lake system and represents a new era for the region. During the previous century, Medina Lake stakeholders experienced extremes in conditions that ranged from eight years of crippling drought in the 1950s to torrential flooding in 2002. Piping the canal system will make Medina Lake more reliable during droughts. Considering the amount of federal, state, and regional funding currently available, both partners understand that it's better to act now. As the saying goes, "Every time history repeats itself, the price goes up." For more information, contact Adam Conner at 210-233-3452 or adam.conner@saws.org. SAWS thanks BMA for cooperating in this analysis and hopes the final product is useful in BMA's endeavor to pipe a significant amount of its canal system. The authors are indebted to the USDA for most of the data used in this analysis and the following individuals for their feedback and review: Steven Bereyso (SAWS), Gregg Eckhardt (SAWS), Dan Fulwyler, (Vale Oregon Irrigation District), Rhoda Benson (Roza Irrigation District), Jerry Bryan/Jer Camarata (Farmers Irrigation District), and Justin Harter (Naches-Selah Irrigation District). Adam Conner is a water resources planner with SAWS who is responsible for strategic water supply and demand planning as well as surface water asset management. Conner has a bachelor's degree from the University of Texas-Austin, a master's degree in water management from Texas A&M University, and a Project Management Professional (PMP) credential. 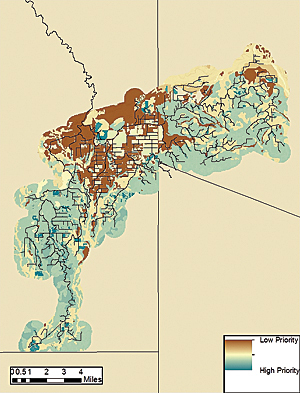 Katherine Tillison, an intern with SAWS, is applying ArcGIS to analyze and improve SAWS water resources. She is currently pursuing a bachelor's of science in biological and agricultural engineering at Texas A&M University and eagerly anticipates her graduation in May 2014.